EV's get a free ride on the Roads but provide a tremendous Environmental benefit to our air. Gas cars pay road tax but get a free ride on the environment for the Pollution and damage to our air. Vehicles have two impacts on the state: With the demise of coal, Fossil Fuels for transportation are the biggest remaining Energy emissions impact on our state. Vehicles add wear-and-tear to both the roads and the environment . Currently, Fossil fueled vehicles pay only a road-usage fee via the Gas tax, but they do not pay for the pollution and the environment they are consuming. 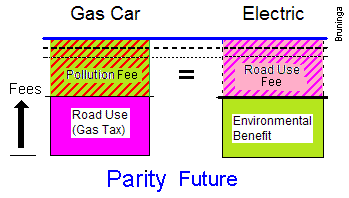 Similiarly, EV's pay a huge environmental benefit, but are not paying the road tax as shown in the graphic above right. Any consideration of adding a road-use fees to EV's should also end the Free-Ride that fossil fueled vehicles get with resepect to their wear-and-tear on the environment. Its time for an Adjustment! EquityTomorrow: But, as we consider possibly raising usage fees on EVs, to be fair, we need to also raise the pollution fee on fossil fueled vehicles as shown above (right). The solid colors in the figures are currently paid. To maintain parity in the future, the hashed colors need to be paid by both vehicles. As we raise the road fee on the EVs, there must be a comparable and equal rise in the pollution fee on fossil fueled vehicles. The mechanism for collecting these fees is probably at the MVA. This new usage fee is inversly proportional to EPA rated MPG for all fossil fueled vehicles including hybrids. For all EV's and PHEV's the fee is similarly inversly proportional to MPGe. This maintains equity across all Vehicles regardless of tonnage, size, weight, hybrid status or battry size. 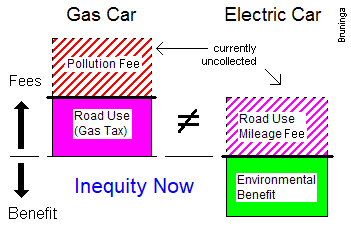 To maintain fairness, all income from fossil fuels go to Air Quality and the environment impacted by these vehicles and all fees from EVs go to the roads. Download a 1 page paper on this topic. See also the page on Payin-to-Plugin for easy use of 115v outlets at work.